To send a gift you can specify delivery direct to the recipient along with a message from you - just add this at checkout. Oil & More There are 3 products. A selection of gift packed Oils and Vinegars. At checkout, you can if you wish, specify delivery direct to the recipient and add a message. A selection of the finest infused oils ranging from the ever popular and simply fantastic A l'Olivier Basil Oil to the stunning Colonna Lemon Oil. Why not try something a little different like a Rapeseed Oil with lemon? 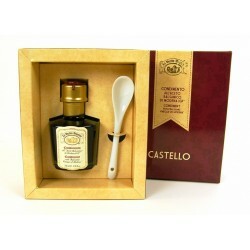 A selection of the finest vinegars, including a Chardonnay and Moscatel wine vinegar and a stunning Raspberry vinegar which makes a fantastic salad dressing. A range of oil storage tanks from a lovely 3 litre tank, perfect for the kitchen work top, to a 100 litre tank ideal for storing oils, wines, beer etc. A selection of quality mustards including the famous (and very tasty Pommery Range) - watch out for the Firemans mustard! Finest quality preserved meats including pâtés from France and Spain along with the best in preserved fish - try the Ortiz Tuna simply the best tuna you can buy. Our wide range of pasta: hand made in Italy, including a fantastic squid ink spaghetti and the hard to find Orechiette. Rice: Carnoroli for your risotto and Calasparra for your paella. 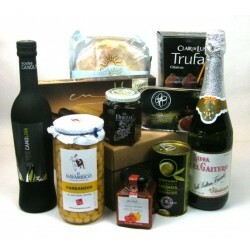 A selection of the finest truffles and mushrooms, including some beautifully packaged gifts. A wide range of quality herbs, spices and salt, including the best vanilla extract you can buy and the now famous Halen Mon salt. 2 bottles of superb extra virgin olive oil. 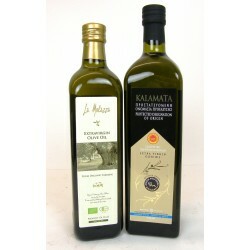 750ml of Organic Italian Oil and 1000ml of Greek PDO oil from Kalamata.